Links to this page can be found in Book 9, Day 3, Map B3 and Rione Monti. of Argus, his false guest. but the name of the street was most likely a reference to argilla (clay). We know from Martial and Seneca that many booksellers had their shops in Argiletum, but most likely in its initial section near the Senate. In the XVIIIth century the street was flanked by churches and religious institutions. The view is taken from the green dot in the 1748 map below. 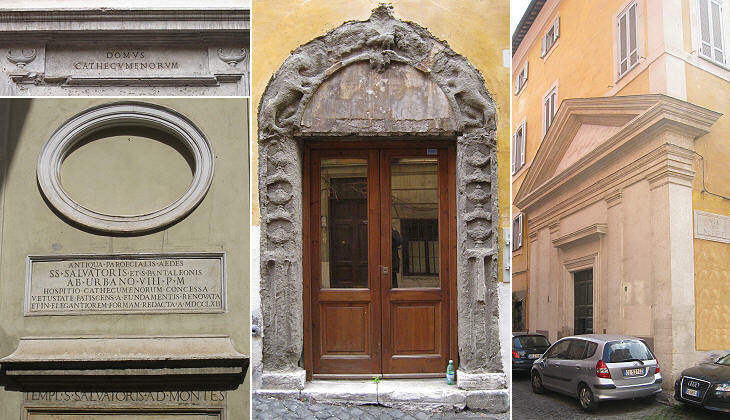 In the description below the plate Vasi made reference to: 1) S. Maria ai Monti; 2) Collegio de' Neofiti; 3) S. Salvatore ai Monti; 4) short alley leading to Monastero delle Cappuccine. The small map shows also 5) Oratorio di S. Giovanni Battista. In the 1880s town planners identified the need for a large street linking the area of the Imperial Fora with Stazione Termini, the central railway station; they came to the conclusion that it was not possible to enlarge Via della Madonna dei Monti, the ancient Argiletum, and they opened Via Cavour, a brand new street, which runs parallel to it; the Capuchin nunnery mentioned by Vasi was pulled down together with S. Maria della Concezione, its small church. The Capuchin nuns were called Farnesiane because their convent was founded by Francesca Farnese in 1641, but also the Sepolte Vive, the buried alive, because they were not allowed to ever see even their parents; in addition to Lent, they fasted from All Souls' Day to Christmas; according to some foreign writers in search of local colour they had a skull in their refectory hall and they slept in their coffins, but these details are denied by Rev. Jeremiah Donovan in his 1844 Guide to Rome. Apart from the modern building opposite S. Maria dei Monti there have been no other changes, even the small house in the middle of the street is still there. In the XIIIth century the site of the church was occupied by a nunnery of the Poor Clares; probably because the area was unhealthy the nuns moved to S. Lorenzo in Panisperna which was located on higher ground. The building was sold and one of its halls was turned into a hayloft; on April 26, 1580, a blind woman miraculously recovered her sight after having prayed in the hayloft in front of an old fresco portraying the Virgin Mary. 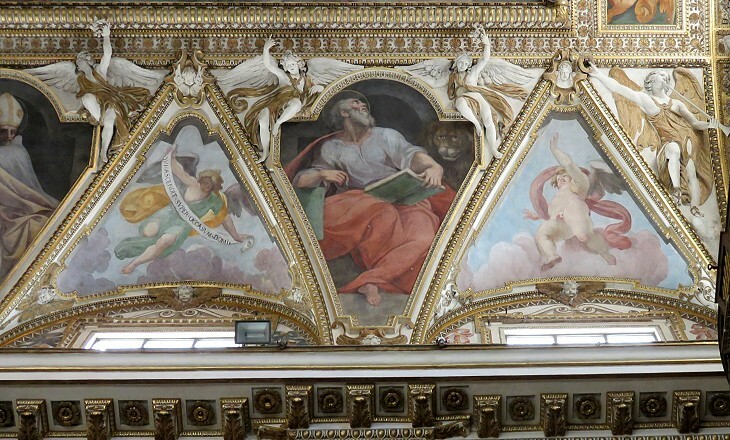 Pope Gregory XIII suggested relocating the fresco to SS. Quirico e Giuditta, but the inhabitants of the neighbourhood opposed the move and eventually the Pope decided to build a new church (on the same site) to house the sacred image. 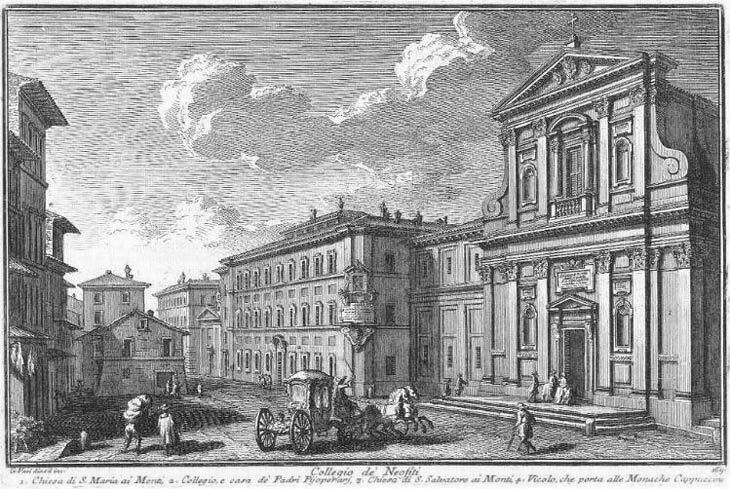 S. Maria ai Monti was designed by Giacomo della Porta; you may wish to see the church as it appeared in a 1588 Guide to Rome, immediately after its completion. 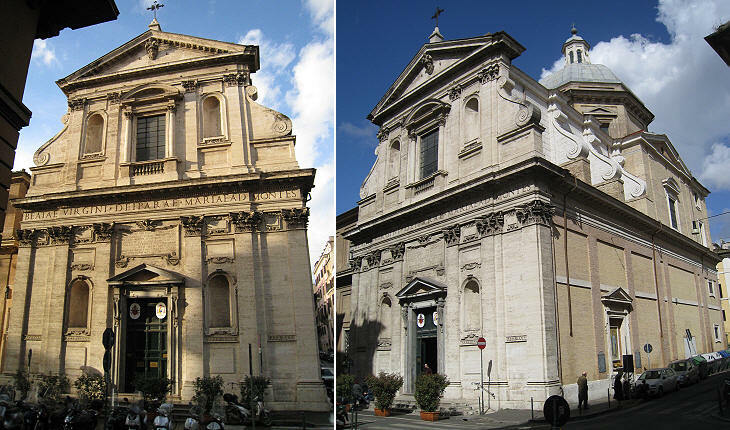 The church became so dear to the Romans that it is usually called Madonna dei Monti, rather than S. Maria ai Monti, Madonna being a more colloquial term to indicate the Virgin Mary. 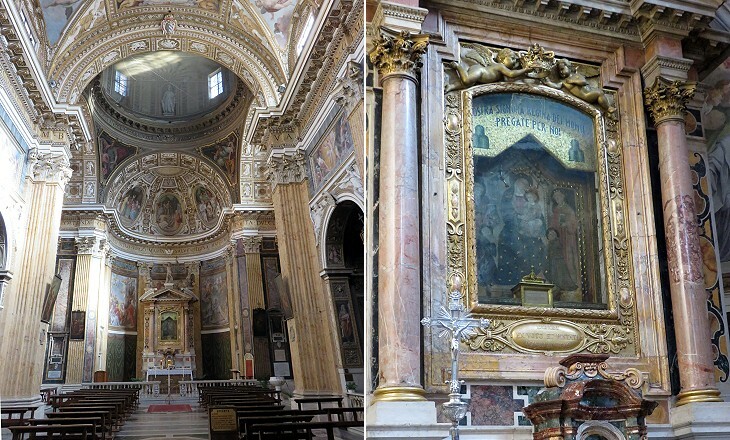 Unlike other small churches of the neighbourhood, S. Maria ai Monti has a lavish decoration and many interesting paintings (two of which you can see in a page covering the iconography of the saints). Cristoforo Casolani (ca 1582-1622) belonged to a family of painters from Siena, but he mainly worked in Rome as assistant to other better known artists. 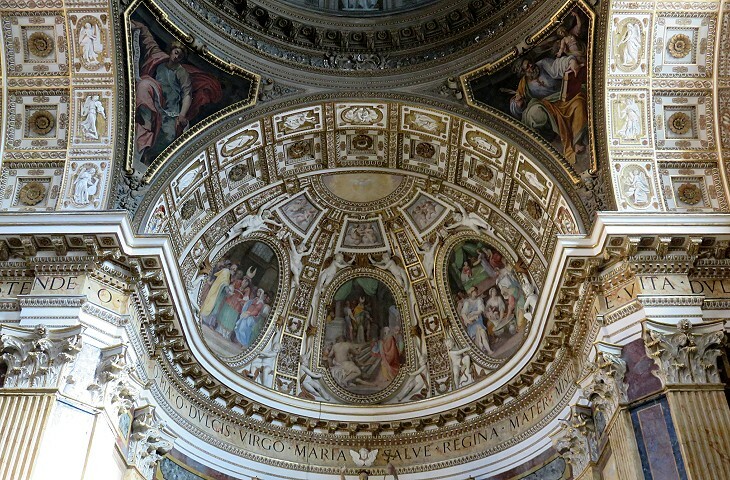 The decoration of S. Maria dei Monti and to a lesser extent that of S. Silvestro in Capite were the only opportunities he was given to show his skill. 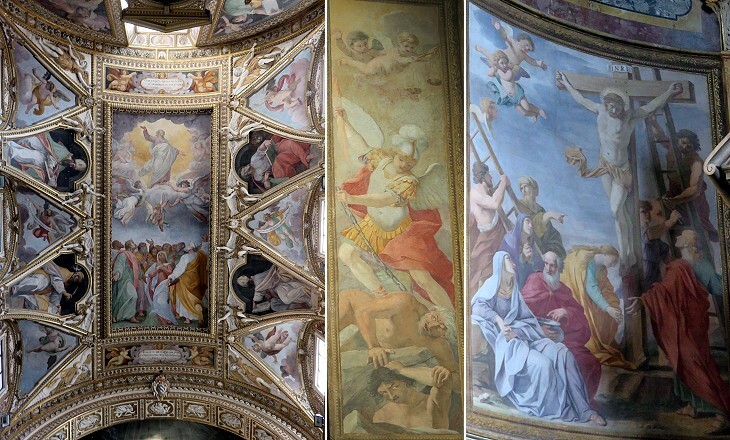 The stucco frames of the vault of the apse and of the ceiling were designed by della Porta and other architects and Casolani was asked to fill them with frescoes. 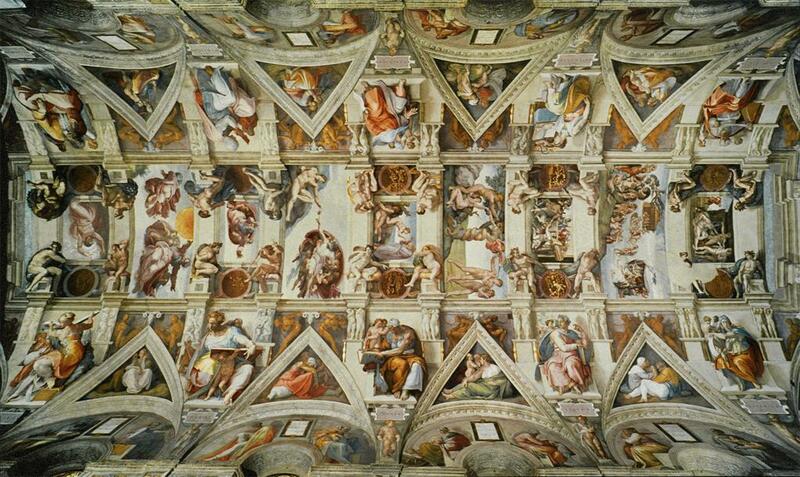 The ceiling partition into triangular sections reflects the pattern introduced by Michelangelo in the Sistine Chapel (it opens in another window); it is one of the first barrel vaulted ceilings of Rome and Cingolani, especially in the depiction of flying angels, introduced some elements of that illusionistic painting which eventually characterized most XVIIth century ceilings (more on this topic in a separate page). In 1543 Pope Paul III founded an institution aimed at assisting catechumens (would-be converts preparing for baptism) and neophytes (new converts wishing to become priests); these were mainly Jews, but also Muslims who had been captured in the course of fights with the Ottomans and the corsairs of northern Africa; the institution, which was in part financed by a specific tax levied on the Jews of Rome, was housed for some time in the building known as Casa di S. Caterina. 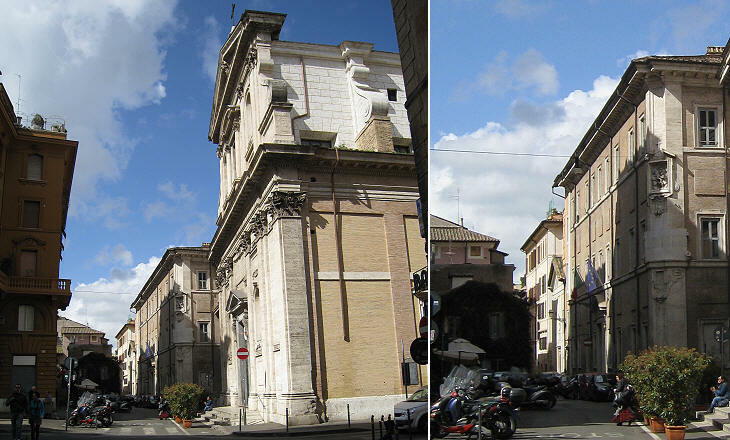 In 1634 Pope Urban VIII assigned the small church of S. Salvatore ai Monti to the institution; his brother Cardinal Antonio Barberini the Elder bought the properties between this church and S. Maria ai Monti and built Collegio de' Neofiti there: it was designed by Gaspare de' Vecchi. The main portal (which you can see in the image used as background for this page) was decorated with the Barberini bees, but they were erased during the French administration of Rome. Today the building houses a department of the Third University of Rome. 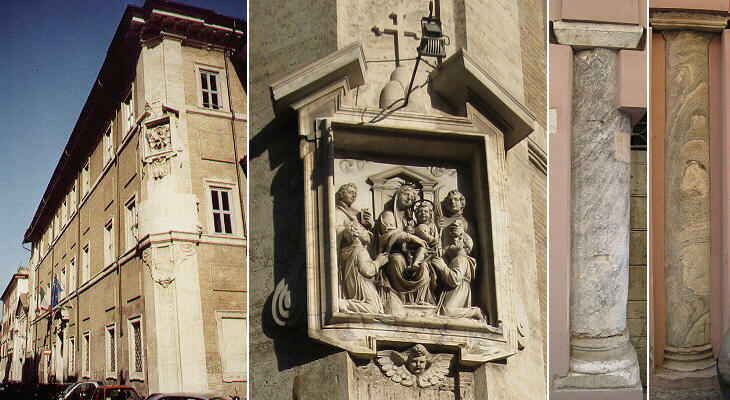 Pope Innocent XI enlarged the building with a wing for women and he built a small oratory for them; his heraldic symbols (eagle, lion and incense burner) can be seen on two doors. The conversion of Jewish children was often a cause of controversy, especially when they were abducted from their families on the grounds that they had received emergency baptism; the practice was supported by Canon Law and it was enforced until the very end of the Papal State, the last recorded case having occurred in 1864. Next plate in Book 9: Palazzo dell'Accademia di Francia. Next step in Day 3 itinerary: Piazza alli Monti. Next step in your tour of Rione Monti: Piazza alli Monti. Questa fu eretta circa l'anno 1579. con disegno di Giacomo della Porta, per un miracolo qui occorso, colle limosine de' fedeli, e prese un tal nome perchè sta in mezzo a tre monti. Essa è ornata di marmi, stucchi dorati, e molte pitture; quelle della prima cappella a destra dedicata a s. Carlo, sono di Giovanni da s. Giovanni, le nozze di Cana in Galilea, che si vedono sopra la porta, sono del Cav. Guidotti; la Pietà nella cappella, che siegue, è copia di Lorenzo da Bologna, e la Flagellazione è di Lattanzio Bolognese; il portar la Croce, del Nogari, e la Resurrezione con altre pitture a fresco sono di Gio: Batista Lombardelli della Marca. Le pitture nell'altare maggiore e cupola sono di Cristoforo Consolano, l'incoronazione della ss. Vergine, e la visitazione di s Elisabetta sono di Baldassarino da Bologna. L'Assunzione è del Cav. Guidotti; la Natività del Mumari; le pitture nella volta del Nogari; e le altre sono di Cesare Nebbia; la ss. Nunziata nell'ultima cappella, ed il resto sono di Durante Alberti, e le pitture nella volta sono del suddetto Consolano. Da Urbano VIII. fu eretto questo collegio l'anno 1635. con disegno di Gaspare de' Vecchi, per istruirvi i Catecumeni, ed insegnare a Neofiti le lettere. Ultimamente poi la chiesa suddetta, ed il collegio furono conceduti con tutte le loro entrate ai Chierici Pii operarj.